Quantitative measurements were made of soluble and total proteins in a study of tuber protein inheritance in selected Phureja-haploid Tuberosum families. The effects of ploidy and location were also examined. 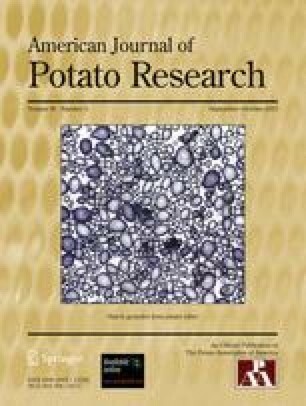 A preliminary study comparing methods for measuring tuber proteins revealed that the technique described by Gusta et al., (1), was most suitable for total protein; while the TCA technique was satisfactory for analyzing soluble proteins. The method described by Potty (2) was used in both classes for final protein determination. Both protein classes appeared to be directly influenced by ploidy level and growing location. More important, the relative amounts of tuber protein were substantially increased in the first generation of selection. Scientific Journal Series Paper No. 1427 of the Minnesota Agricultural Experiment Station. This research was supported by a grant from the Rockefeller Foundation.